Ebisu is Shibuya's upmarket neighbour and an equally good nightlife spot. Bars are what Ebisu specialises in, of which the options are endless. To discover the best, read on. Just one stop south of Shibuya on the Yamanote Line lies Ebisu, a district with an upmarket reputation and a whole lot going on. Ebisu is particularly notable for its eating and drinking culture, with izakayas (Japanese-style pubs), restaurants, pubs and bars filling the streets and alleys around the station and beyond. You may have heard of Ebisu Yokocho – a lively covered alley of various izakayas – or Yebisu Garden Place – the home of the famous Yebisu Brewery, from where the area take its name. These spots are great, but there’s a whole lot more to be discovered. 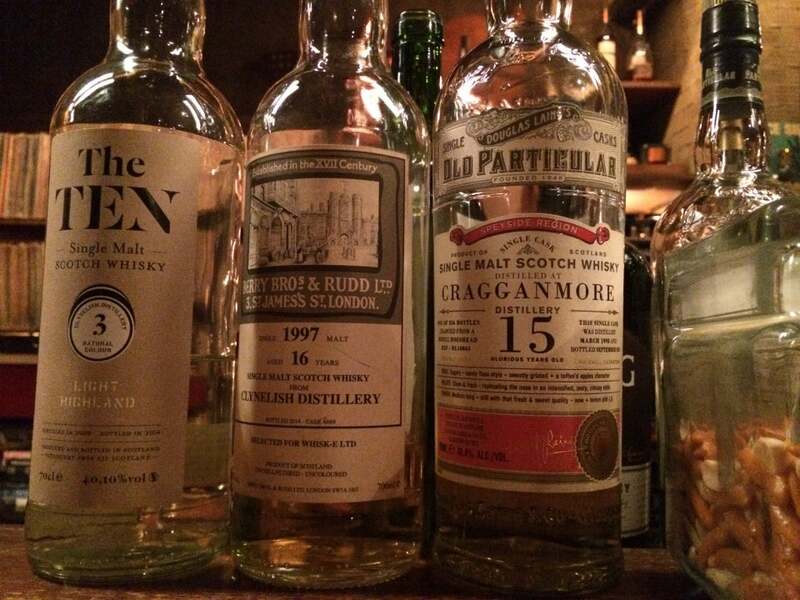 In what follows, we’ll take you on a tour of the highlights of the Ebisu bar scene. You won’t be disappointed. For more bars in nearby Shibuya, take a look at our full rundown, here. Buri is a standing bar (yes, no seats) which specialises in sake. If you’ve never tried out sake before, this is the best opportunity you’re going to get. The staff are fantastic and will happily guide you through a few different varieties if you’re lost. The food, a wide-range of perfectly executed Japanese classics, is also excellent and compliments the liquor well. 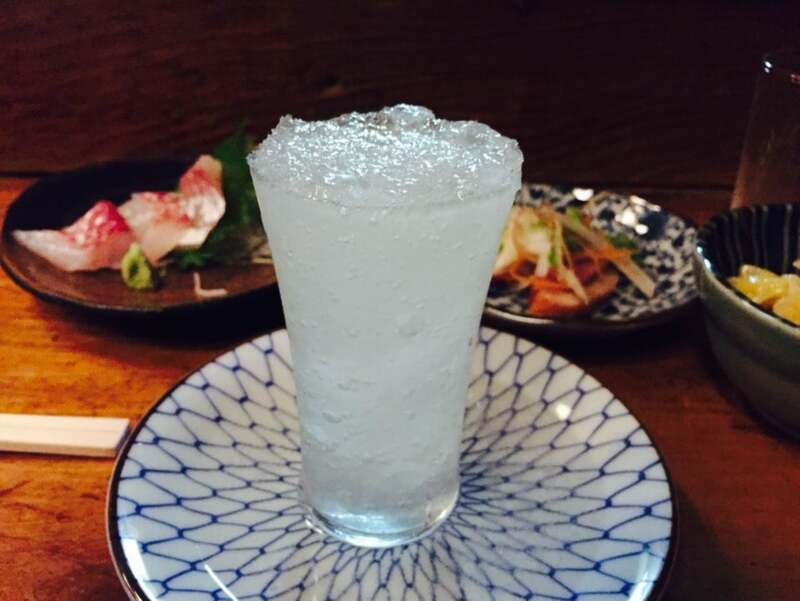 Year after year, Buri is ranked among the best izakayas in the city – drop by to find out why. If you’re on the hunt for something a little different to a beer, The Stella may just be the Ebisu bar for you. 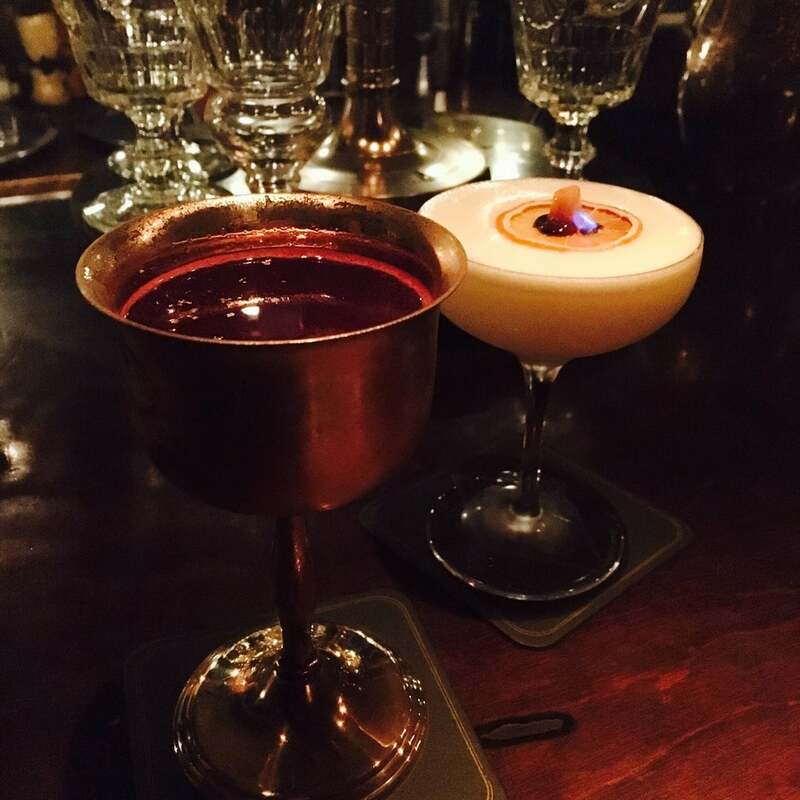 Using unusual ingredients and employing scientific methods, the bars team of mixologists serves up a fantastic array of weird and wonderful concoctions that can’t fail to impress. There’s some tried and tested favourites on the menu, but if you can’t decide, the bartender will whip up something just for you. The Stella opens late, giving you bags of time to experiment. Wine Bar M’s cellar is extensive, with over 120 wine types to choose from. Whether you’re after a particular vintage or whatever’s cheapest, the friendly staff will be more than happy to oblige you. The interior is cosy and warm, making it a great bar in which to take it easy after a long day. Wine Bar M also holds a yearly wine tasting event which should not be missed (this year’s event will take place on March 26th from 13:00 to 15:00). 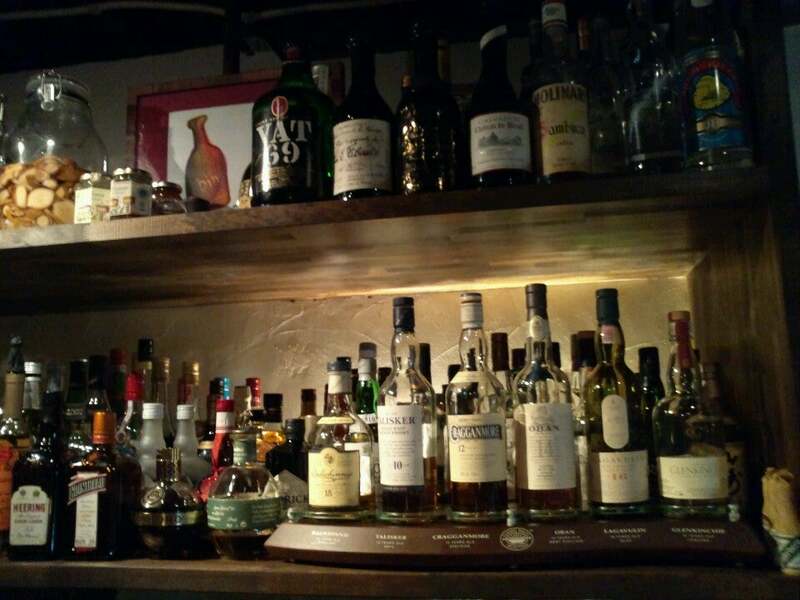 The combination of cheap drinks and live music is a good one and what makes Bar Yaya an Ebisu classic. Three or four artists perform at Bar Yaya almost every evening and even when there’s nothing planned the owner likes to get up and play a few songs on his guitar. The entrance fee is just 2,000 yen which also includes a drink of your choice from the bar. The only downside is that the bar switches to VIP-only after 22:00, so keep an eye on your watch or pay a little extra to stay for the long haul. 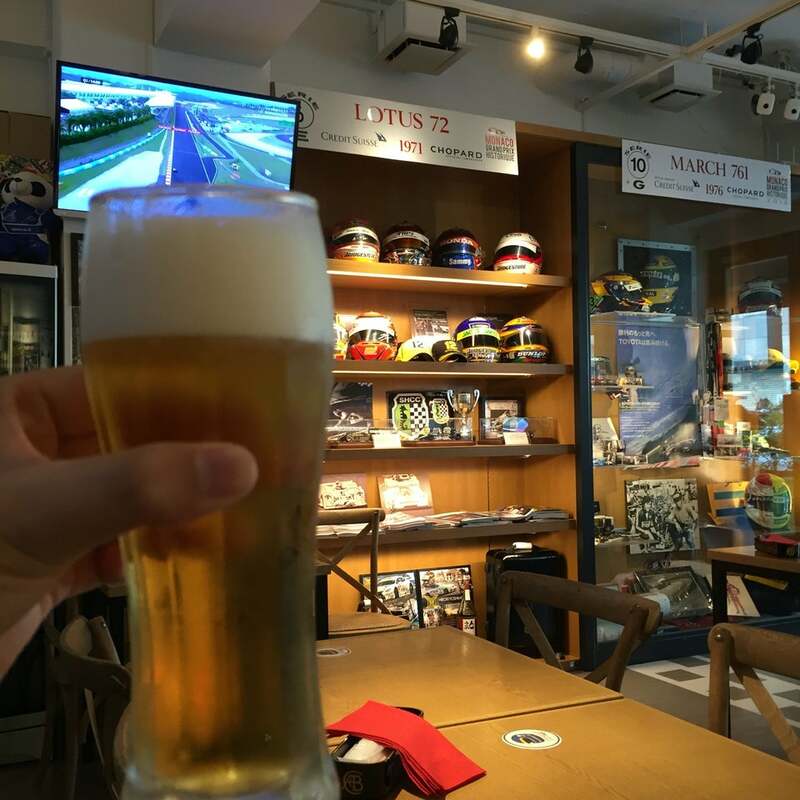 A motorsports-themed bar located just three minutes from Ebisu Station. Racers’ Cafe serves Italian cuisine at reasonable prices, authentic Italian espresso and come the evening, a brilliant array of cocktails, wines and beers. A somewhat quirky little bar with a cosy feel and friendly vibe, Racers’ Cafe is great for something a little different. 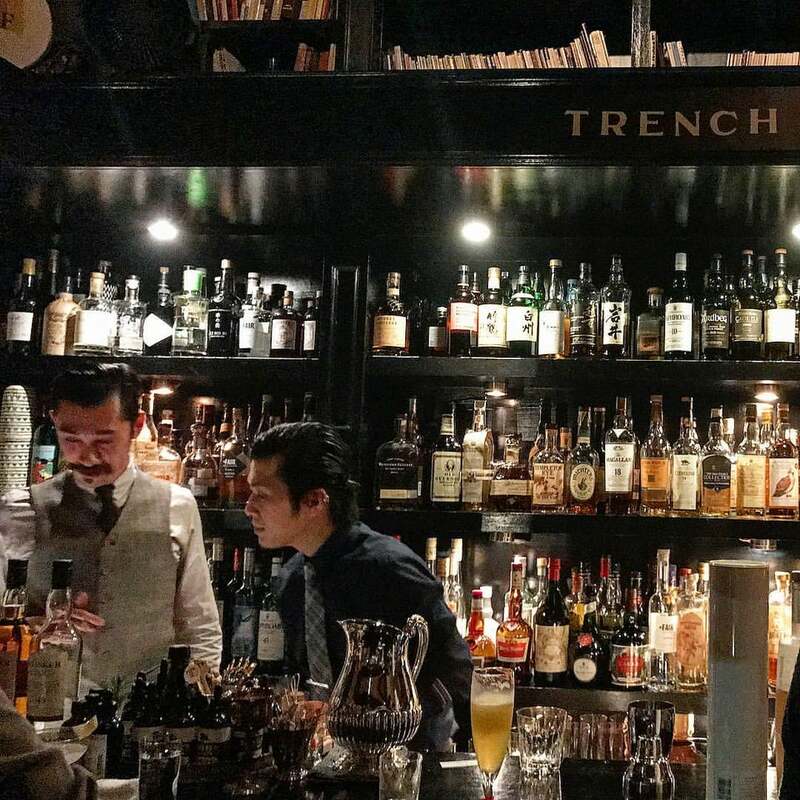 This atmospheric watering hole in Ebisu is definitely one of the most interesting bars in Tokyo. The bar itself has a classic feel: dark wood, exposed brick and vintage details. However, the drinks selection is anything but classic. Trench Bar is committed to inserting an element of fun and whimsy into drinking; they serve up cocktails with names like ‘Corpse Reviver #2’ and ‘Monkey Gland’, use ingredients like blowfish and squid infused shochu, absinthe, lime, dill, cucumber, yoghurt, persimmon and chilli to create cocktails like you’ve never tasted before. The artichoke mojito and smoky ‘Laphroaig Project’ come particularly recommended. Bar Tram specialises in medicinal herbal liqueurs, all of which are absinthe based. Again, this is a bar for a taste of something new and interesting. The menu is packed with choice, but when pondering your next drink be sure to consult the bartender who’ll be happy to offer up a few tips and recommendations. Yebisu Garden Place is advertised as a “city within a city”: an entertainment, retail and office hub in the heart of Ebisu. Certainly, its European vibe and split walkways give the place a distinctive feel. The whole place is built around the site of the Yebisu brewery, meaning that if it’s a beer you want, you won’t be disappointed. 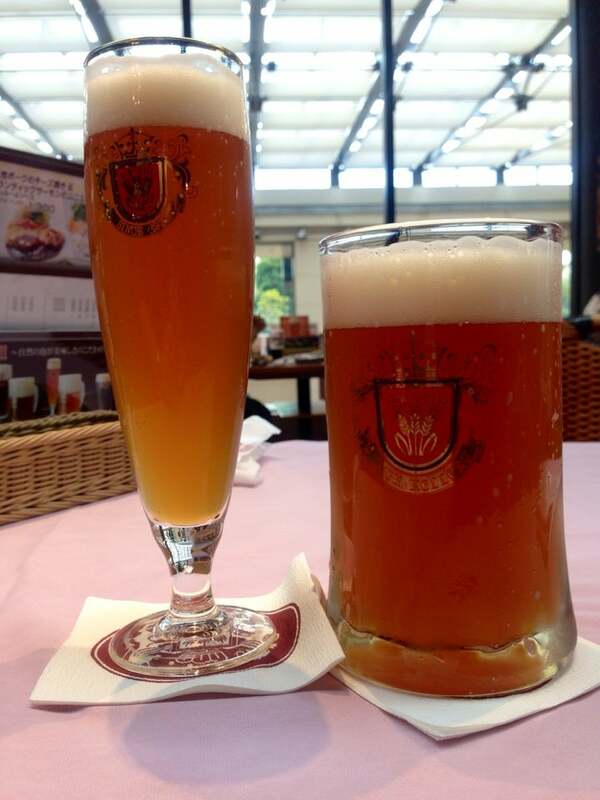 Head to the Beer Station and you’ll find a small museum dedicated to the brew aside a large and very popular bar area serving up a host of different Yebisu beer varieties. The Beer Station also serves a small selection of quality Western-style food if you find yourself a little peckish. A lovely little jazz bar three minutes from Ebisu Station, Vagabond Ebisu is the sister venue of Vagabond Shinjuku, a legendary jazz venue opened in 1976. 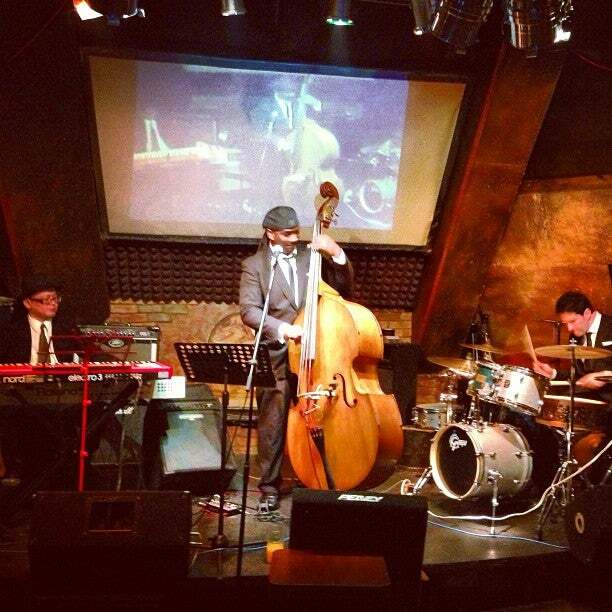 Both branches of Vagabond have healthy reputations in the jazz world and thus attract a steady flow of jazz fans and artists from overseas. 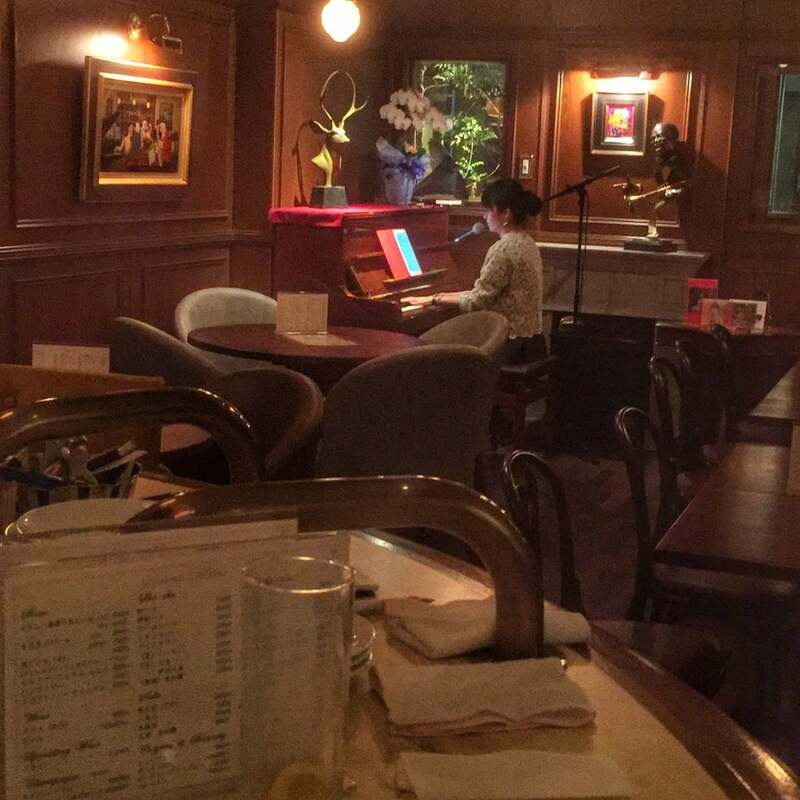 Although the Ebisu branch is a little smaller than the original, it has a somewhat more relaxed vibe perfect for a lazy jazz-filled evening. What the Dickens is a sort of mix between a live house and British pub. Bands playing everything from jazz to rock grace the stage each night of the week and customers are treated to a bar stocked with British beers and ales, as well as a food menu featuring such classics as steak pie and fish and chips. The atmosphere is always fun and prices aren’t too bad either. 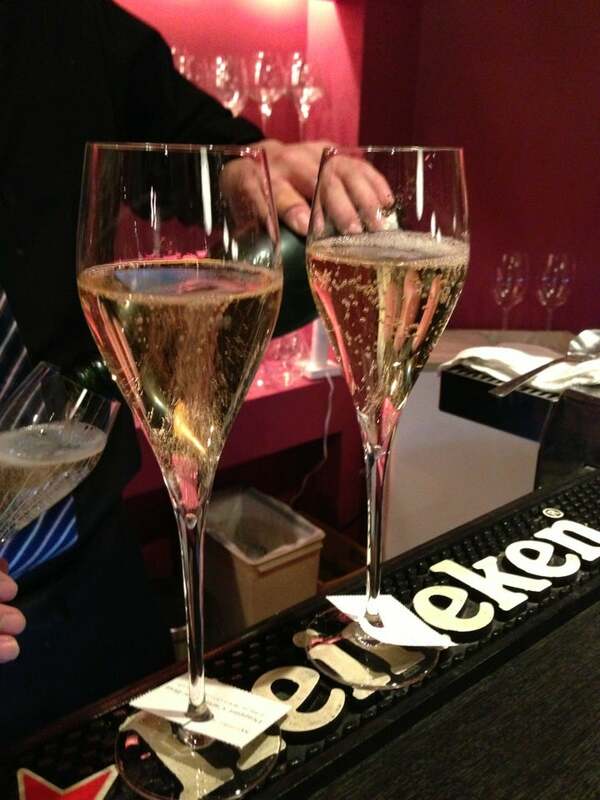 Opened in 2004, Nos Ebisu is loved by party people from all over the world. If you’re just after a quick couple of drinks, the standing bar, with its inexpensive cocktails, is ideal, though if you’re after some food you’ll need to head to the lounge. Here, Nos Ebisu serves up menu items like grilled meats, pasta dishes and sandwiches, all of which are to a great standard. Nos Ebisu stays open until 5:00 on Fridays and Saturdays, making it a classy option for a hang-out should you miss the last train home. Bar Track is a super cool little bar with an intimately cosy vibe and a well-stocked top-shelf, perfect for a laid-back drink or two. 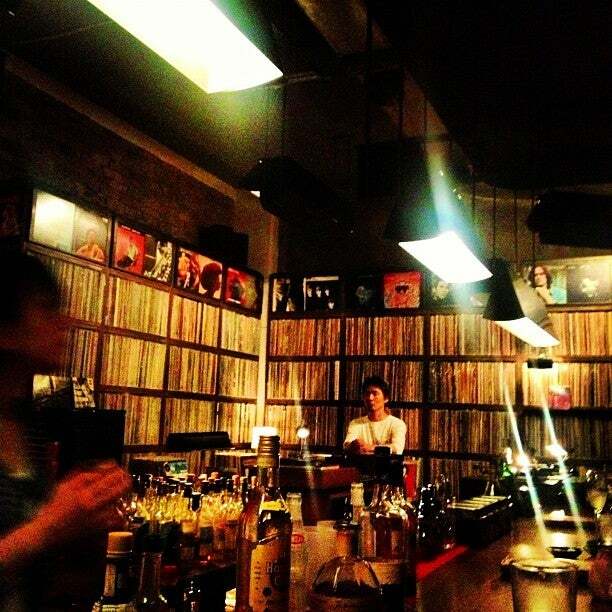 The record player in the corner fills the bar with music and they may even take requests if you ask them nicely. Helpfully, the bar staff speak pretty good English too. 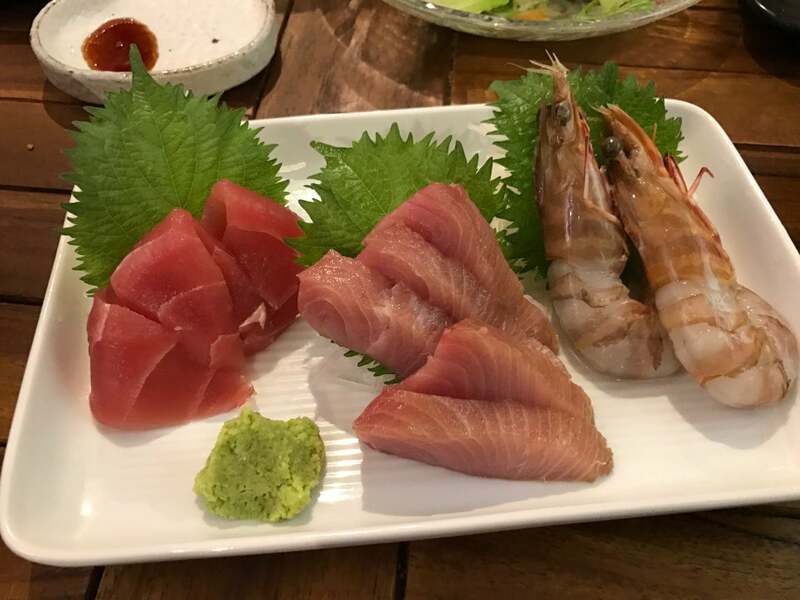 Located within Ebisu Yokocho, Uomaru offers fresh and simple seafood dishes paired with choice Japanese sake. The staff don’t speak much English but are friendly and will do their best to help you along. Ebisu Yokocho izakayas are always lively and Uomaru is no different. 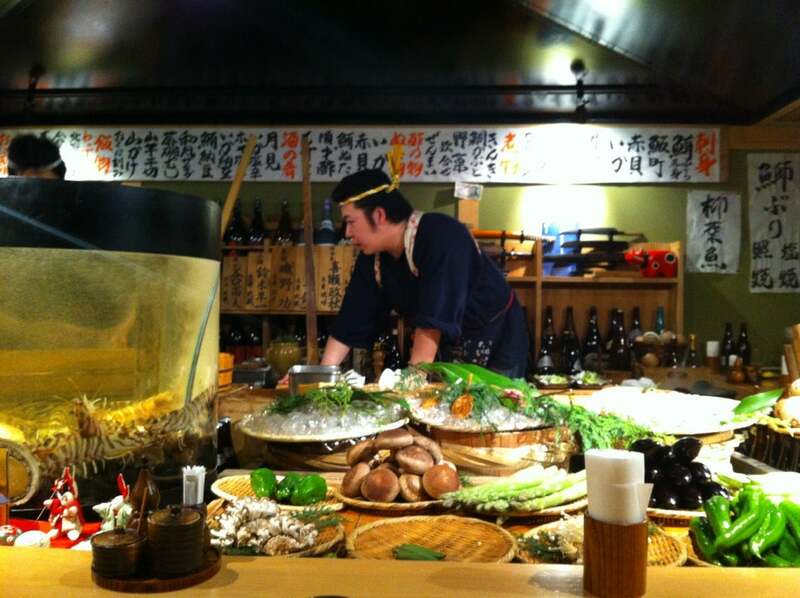 A typical Japanese izakaya located just a few minutes walk from Ebisu Station. Saiki is intimate, with only two tables and less than 10 seats at the counter. Big parties, therefore, should look elsewhere. 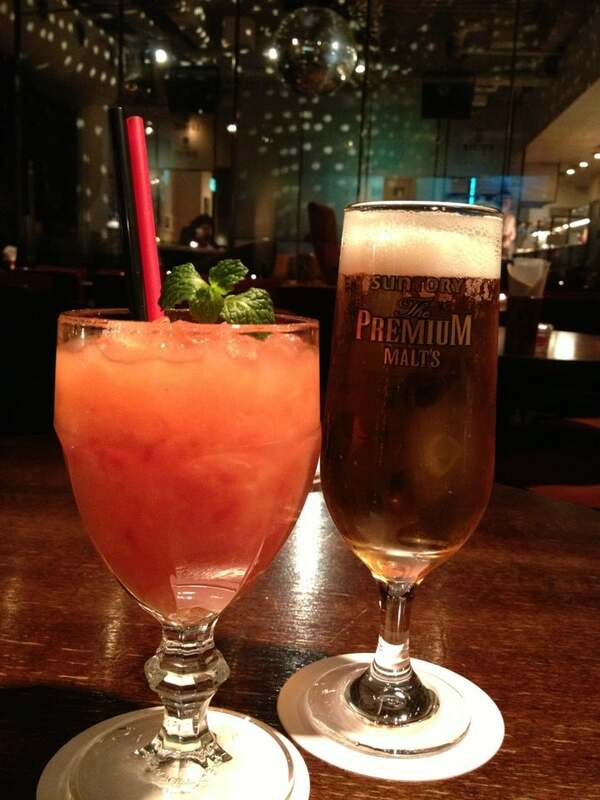 If you’re alone or a couple, however, there are few places in Ebisu better. There’s no English menu but even a lucky dip will yield delicious results. The sashimi, tempura and duck come particularly recommended, or try one of the daily specials for something seasonal and tasty. But why is Saiki on a list of Ebisu’s best bars? Well, for its legendary frozen sake. This house special goes down well all year round, though in the summer especially. A casual whisky and cocktail bar with more than a hint of cool. The dimly lit interior is sumptuously chic, with huge cut glass chandeliers and leather furnishings throughout. The main event though is the drinks. The skilled bartenders will knock you up any cocktail your heart desires or there’s the choice of over 400 whiskies from the best distilleries in the world. Perhaps a combination of the two might be called for. Bar Martha is another super cool little bar. The owner’s record collection lines the walls and a state of the art record player takes pride of place in one corner of the room. You’re in for a night soundtracked in style, that’s for sure. Let’s not forget about the drinks though, for they too are excellent. The mango mojito comes particularly recommended. Welcoming staff and a friendly atmosphere make this bar another great entry onto our list. They’ve got every type of liquor imaginable lined up at the bar, though if it’s something sweet you’re after, you’re in luck, they also take great pride in their selection of homemade desserts. Believe us, they’re delicious and go surprisingly well with a choice selection from the bar. 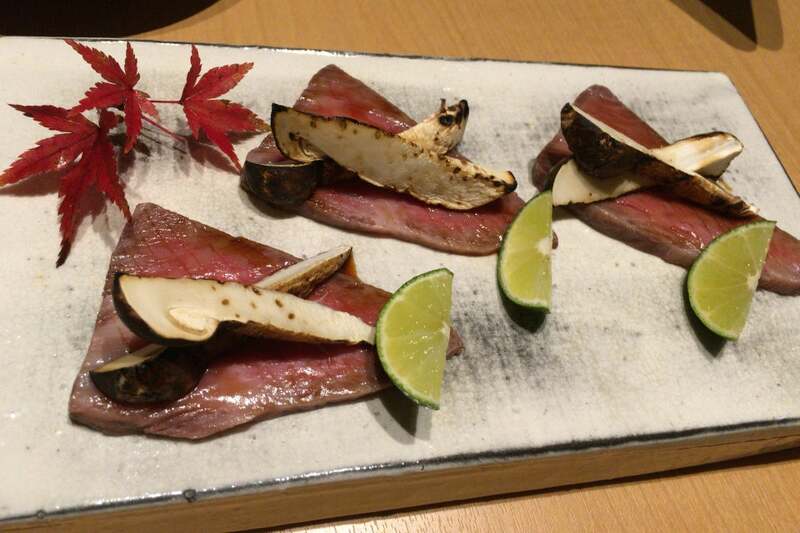 Robataya is an izakaya known far and wide for its grilled fish. The fish are fresh from the market each morning and prepared in-house. 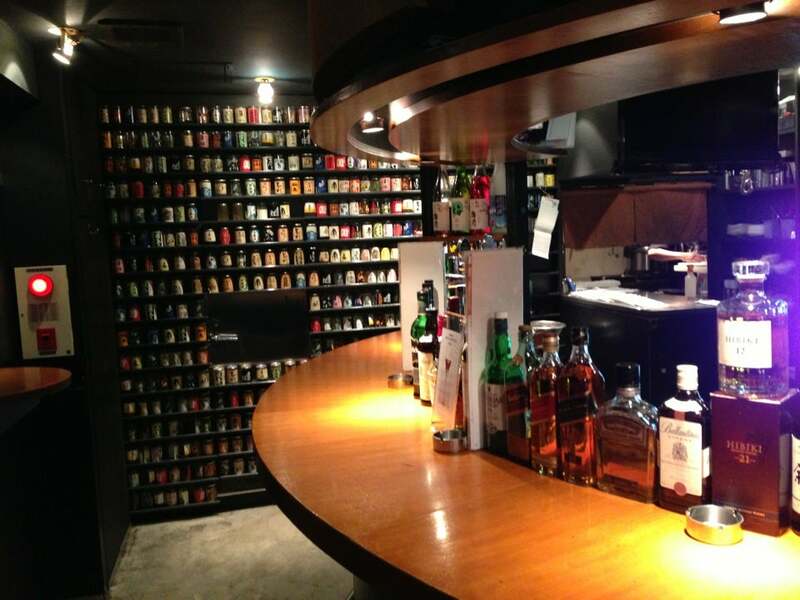 Of course, Robataya also serves up a wide range of beers, spirits and Japanese speciality drinks. The atmosphere inside is always jovial and though not too much English is available, pointing and smiling is sure to do the trick. An excellent sushi bar that also serves an excellent array of wines, whisky and sake. The head chef, formerly of one the world’s best sushi restaurants, is very welcoming to all and will serve you up some world-class sushi of all kinds. Sushi courses start at 1,400 (4 piece), so aren’t as extortionate as some sushi bars. 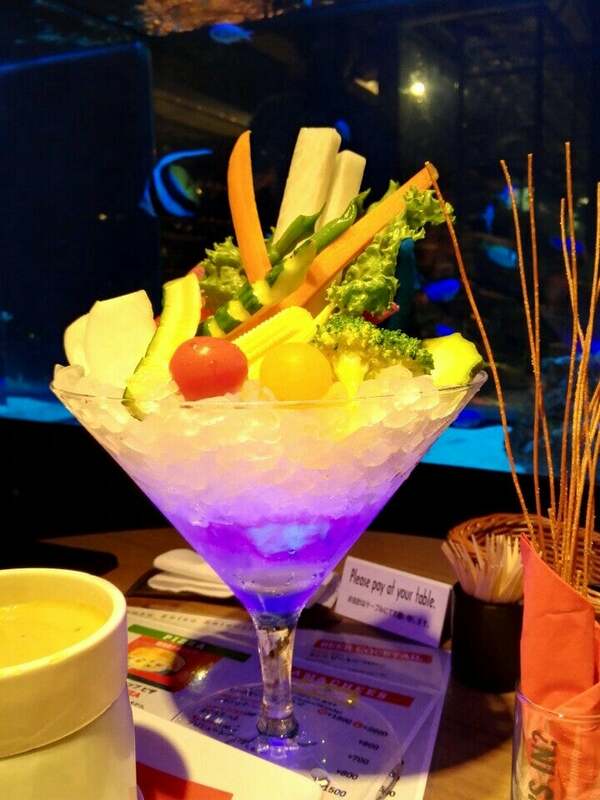 Of course, pairing your fish with a few glasses of sake is highly recommended. Aozuyu, located right in front of Ebisu Station, is our last but by no means least entry. This place is very popular, partly for its location and partly for its excellent selection of cheap food (their Italian-style steak is legendary) and quality drinks (all the usual suspects, plus cocktails and a particularly healthy wine list). The interior is sophisticated and calming, making it a great venue to sip on a few well deserved drinks in the evening. For top tips from other travellers and the chance to have your say, try out our Compathy travel app.